Our Calendar printing system is a great way to have your business advertised this new year. 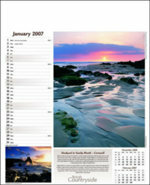 All you have to do is pick out the style of calendar that you like the best from our extensive range. Then we'll have it printed up with your personal details or business logo. So keep yourself advertised throughout the new year and advertise on our Calendar printing! Other calendars besides our Calendar printing click here. Other promotional and personalised items besides our Calendar printing click here. To find out more about our Calendar printing click here and fill in the contact form and we'll get straight back to you.